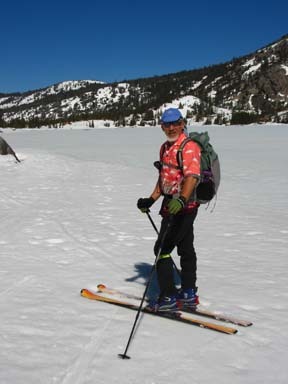 Echo Lakes is a very, very popular destination for skiers and snowshoers alike. They are a perfect place for a leisurely day or night tour; by moonlight the skiing seems effortless over the glowing lakes. Access to the lakes is via an easy to follow road. Once you arrive you can roam the lakes at your leisure and absorb the starkness of the basin that contrasts with the ridges that rise above. The tour to Echo Lakes is rated beginner-intermediate because of the modestly steep, but short, downhill run from the highest point to Lower Echo Lake. Rank beginners may choose this tour knowing that they will have some difficulty with this section. Echo Lakes is also notorious for windy conditions. When the winds are strong, two people holding a jacket between them, or even better a small tarp, can literally sail across the hard surface at an amazingly high speed. Kite flying can also be great if you have a durable one and unbreakable string. 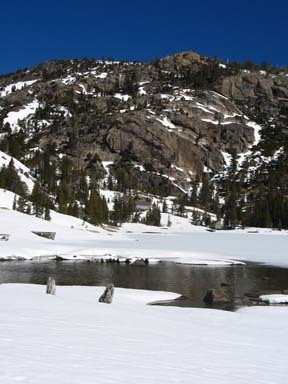 Echo Lakes are usually solid enough to safely ski on during the mid-winter months. Regardless, of the month, you should always assess the conditions before skiing on the lakes. Avoid the inlets and the outlets of the lakes where the ice tends to be thinner. Please stay away from the many privately owned cabins at Echo Lakes. Also, be aware that overnight camping is not permitted in the basin. A short extension of this tour takes you to Tamarack Lake while the extension to Desolation Valley is long. But if you are looking for a grand view and excellent downhill terrain you will want to climb Echo Peak. You do not need a permit to visit Echo Lakes. However, a permit is required for day use as well as overnight camping in Desolation Wilderness, which begins approximately one-half mile west of Upper Echo Lake. This means that the Tamarack Lake, Desolation Valley and Echo Peak tours require permits. If it is safe, ski northwest across the lower lake for 1.4 miles until you reach its northwest end (3). Otherwise ski along the south edge of Echo Lakes. Skiing along the summer trail on the north side of the lakes is slow, more difficult, and no substitute for the open, hard-packed surface of the lakes. Retrace the route for 3.3 miles back to the trailhead (1).